Now, he’s the most entertaining star of television’s Heisman House football commercials. But, back then, this fabulous football and baseball player was all the rage. Many sports fans regard him as the greatest dual sport athlete ever. Voted #8 on ESPN’s list of the top 25 NCAA football players ever, Jackson dazzled as a fast and powerful running back while at Auburn. The 6’1” and 230 lb. Jackson rushed for an amazing 6.6 yards per carry. He amassed a staggering 4,575 career yards and scored 45 total touchdowns (43 rushing and 2 receiving). This Heisman Trophy winner became the number one overall pick in the 1986 NFL Draft by the Tampa Bay Buccaneers. 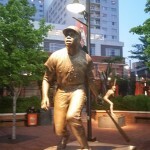 However, because the Bucs inappropriately contacted Jackson outside of NCAA rules and regulations, the running back became ineligible for baseball during his senior season in 1986. As a result, Jackson chose not to sign with Tampa Bay and agreed to play professional baseball with the Kansas City Royals organization instead. While at Auburn, Bo Jackson starred in two other sports. The football star qualified for the United States Summer Olympic Trials twice in the 100 yard dash. Jackson’s incredible speed became extremely evident during the spring of 1985 when he recorded the fastest 40-yard dash time ever at 4.12 seconds at the NFL Combine. In addition to track, the former Auburn Tiger excelled on the baseball diamond. In 1985 he batted .401 with 17 home runs and 43 runs batted in while starring defensively in the outfield as well. After graduating from Auburn, Jackson played eight years in Major League Baseball with the Kansas City Royals, the Chicago White Sox and the California Angels. He also left his mark in the NFL while playing four seasons with the Oakland Raiders. This phenomenal athlete is still the only athlete ever to be voted an all-star in two different professional sports – Major League Baseball and National Football League – and NOT be voted into either sport’s Hall of Fame. 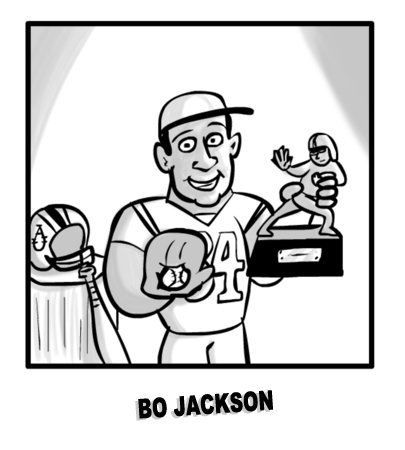 Sadly, Bo Jackson’s brief but memorable dual-sport career ended prematurely. Without his hip injury, he undoubtedly could have been a Hall of Famer in two professional sports…..
…..a fact, thanks to the 2012 ESPN Films 30 for 30 “You Don’t Know Bo” documentary, that every sports fan now knows. And not just Bo!